James Comey’s wife and four daughters worked hard to elect Hillary Clinton. 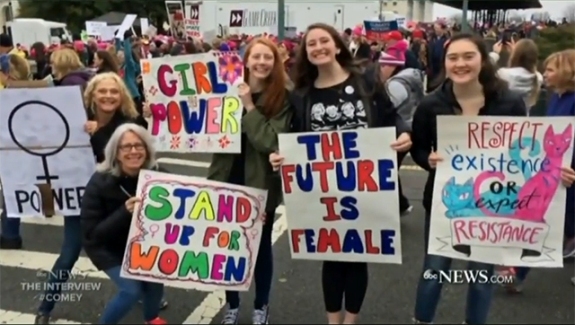 Comey proudly told George Stephanopoulos that they attended the Women’s March held the day after President Trump’s Inauguration. They are liberal activists. And I’ve noted on this site repeatedly over the years–as Republicans and conservatives constantly cheered this guy–that he was a liberal. As I always says, pillow talk is the most effective form of free speech, and you can bet Comey listened to his wife’s pro-Hillary baloney. Above is the picture of Comey’s wife, Patrice, complete with birth-control goggles, and his four daughters, at least two of whom look like exactly him with longer hair. Let’s be clear: they are far-left activists, as was anyone marching in this annoying protest. You think that didn’t enter into the equation with any of Comey’s actions? Puh-leeze. The exact opposite. This guy, as I’ve repeatedly said on this site, is a liberal. Always was, always will be. He was compromised and tainted at all times when he was at the Justice Department and certainly when he headed the FBI. 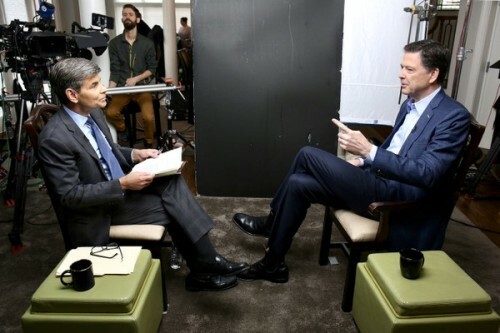 I wrote about how Comey persecuted and unsuccessfully prosecuted my friend, former federal prosecutor Richard Convertino, because he dared get a conviction against dangerous Islamic terrorists who were closely tied to Bin Laden and planning mass murder on our shores. That one picture literally speaks a thousand words. Other than that, I learned nothing new or interesting from last night’s Comey interview. It was a total bore, and I struggled to stay awake through this man’s overwrought grievance theater. Cry me a river. Let me get out my world’s smallest violin. Enough. We’ve heard it all before. Don’t need to hear it yet again. You’re fired. Liberals will eagerly buy and drink up the BS in your book. Now, go away. No word from Deb on Father’s Day? Yes I caught that artist on the Tube. He just stood out. I’m sure there are tons. Debbie on the Richard Dixon show earlier today. This site is finished. Thanks for the memories Debbie. She did it while drinking her favorite Californian Malt Liquor M Peach 45…lol! Debbie, please say something. Are you alright? Are you going to continue with this blog? Something? Are you blogging commenting somewhere else? Give us some indication of what the hell is going on……. For the last few weeks (both this and the previous page of the comments section) I have been linking to Debbie on the Richard Dixon show. My most recent one is only a few comments up. Until Debbie posts her next article, it will have to do. Bmdubya-what are you mumbling about? I remember O.J getting kicked out a restaurant in Florida yrs ago, it made news, understandable but Sarah? This country is in a bad way. Trump is a dictator. An AD was suspended for drunk driving and misuse of gun and Still got promoted?!???? Debbie abandoned her followers like a black guy abandons his black baby. She is a Jew what did you expect? ??? For the rest of you, there are some amazing Alt-Right sites out there. Embrace them, time to move on. Tom S. is also a Jew-hater. Thanks, JeffE, for keeping up this effort, and for all news related to Debbie. When she works out whatever’s going on, she will be back, with an explanation. We must remember that if Debbie could post, she would. In the meantime, there’s always the archives I’m constantly promoting.